Organic Tamanu Oil (Calophyllum Inophyllum) - Sweetgrass&Rain Inc. This variety of Tamanu Oil originates from Madagascar, although it can also be found in South East Asia. 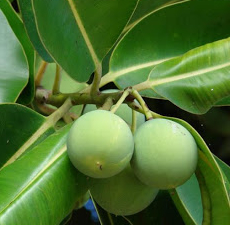 The fruit (seeds) are hand gathered from the coastal Tamanu trees, as they are said to yield the highest quality oil. It grows up to three meters tall, sporting cracked black bark and elliptical shiny leaves. The Tamanu tree blooms twice annually with fragrant white flowers, which later yield clusters of yellow-skinned spherical fruit.